Synthetic peptide (the amino acid sequence is considered to be commercially sensitive) within Human RYBP aa 200 to the C-terminus. The exact sequence is proprietary. K562, SW480, HepG2 and rat PC12 cell lysates; Human placenta and Human clear carcinoma of kidney tissues; HepG2, SW480 and K562 cells. Our Abpromise guarantee covers the use of ab185971 in the following tested applications. WB 1/1000 - 1/10000. Detects a band of approximately 32 kDa (predicted molecular weight: 25 kDa). May be implicated in the regulation of the transcription as a repressor of the transcriptional activity of E4TF1. In tumor cell lines, may induce apoptosis. Widely expressed with highest levels in lymphoid tissues and placenta. Nucleus. Cytoplasm. Primarily found in the nucleus. Observed band size: 32 kDa why is the actual band size different from the predicted? Immunohistochemical analysis of paraffin-embedded, Human placenta tissue labeling RYBP with ab185971 at a 1/100 dilution. Counter stained with hematoxylin. Immunohistochemical analysis of paraffin-embedded, Human clear cell carcinoma kidney tissue labeling RYBP with ab185971 at a 1/100 dilution. Counter stained with hematoxylin. Immunofluorescence analysis of, paraformaldehyde-fixed, HepG2 cells labeling RYBP with ab185971 at a 1/250 dilution. As secondary antibody goat anti-rabbit IgG (Alexa Fluor®555) was used at a 1/200. In blue DAPI staining. 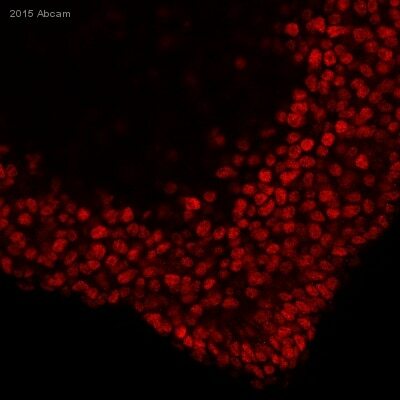 Immunofluorescence analysis of, paraformaldehyde-fixed, SW480 cells labeling RYBP with ab185971 at a 1/250 dilution. As secondary antibody goat anti-rabbit IgG (Alexa Fluor®555) was used at a 1/200. In blue DAPI staining. Flow cytometry analysis of paraformaldehyde-fixed K562 cells labeling RYBP with ab185971 at a 1/40 dilution and secondary antibody goat anti-rabbit IgG (FITC, red) at a 1/150 dilution, or negative control rabbit IgG (green). Western blot analysis on immunoprecipitation pellet from HepG2 cell lysate labeling RYBP with ab185971 at 1/50 dilution and goat anti-rabbit IgG, (H+L), peroxidase conjugated at a 1/1000 dilution. ab185971 has not yet been referenced specifically in any publications. Publishing research using ab185971? Please let us know so that we can cite the reference in this datasheet.